It’s many years since I visited the Bishophill burial ground of the Society of Friends (Quakers). It’s tucked away behind flats, to one side of Carr’s Lane. I don’t think they want sightseers wandering in all the time, but I wanted to visit a particular grave. This is recorded on a separate page. I think we’re all aware of how much Quakers have contributed to the life of the city, but perhaps we think only of the Rowntree family. A statue to Joseph Rowntree was recently suggested as a suitable addition to the city centre. 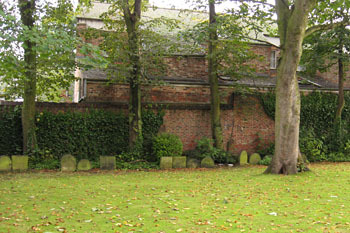 I thought of this Quaker burial ground, with its humble graves. The headstones are all lined up around the walls. This perhaps makes it sound rather regimented, but it’s not like that at all, as they’re in groups, clusters, and some lean a bit. They’re around a large lawned area with mature trees, a high old brick wall, a large gate in one corner. For important persons in the 19th century it was traditional to have your resting place marked with a headstone as large and elaborate as possible, possibly with an added monument of some kind. 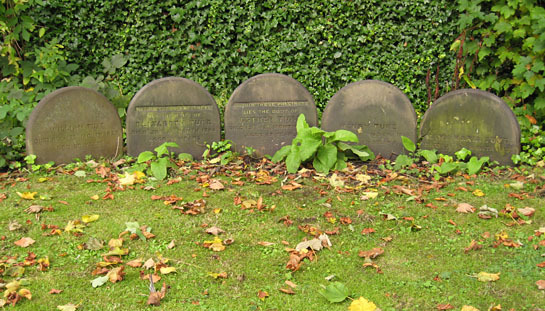 Not so for those of the Quaker faith, buried here in Bishophill under very plain and small round-topped headstones. Most give only the name, age, and date of death. Rather thought-provoking and moving, this humility. Particularly perhaps in this age, when the prominent and often tediously promoted display of our achievements and importance is the norm. This ‘family group’ is particularly touching, in its slightly curved line, a little huddle, like they’re all lined up in a bed. York people should recognise the name. Here lie William Tuke (died 1822), Elizabeth Tuke (died 1760), Esther Tuke, Henry Tuke (1814), Mary Maria Tuke (1815). That is, the founder of The Retreat, and members of his family. Nothing to tell you that, nothing to record the important work, the dedication to easing the suffering of others. Just the names and dates. Earlier photos of the burial ground show the headstones in the central area. One shows a group of five which could be the Tuke family graves shown above. Perhaps someone reading this will know more about the changes here and why they were thought necessary, or indeed acceptable. The Hutchinson and Palliser guide of 1980 records a sense of loss at the changes here, the tidying, the new flats. No doubt I would have felt the same had I known the place before. The author wrote: ‘One of the most moving sights in York has gone’. Again, as with Carr’s Lane alongside, I didn’t know this place then. I still found it moving, this old place with its high brick walls and its humble headstones. The first plot of land here was purchased in 1667, and the burial ground enlarged by the purchase of an adjacent site in 1823. It was closed for burials in 1855. [source] There is also a Quaker burial ground at the Retreat, which has been in use since 1822, according to an article in The Lancet (1840). By Lisa @YorkStories • 22 December 2012 Memorials To link to this page's proper location please use the > permalink. Just re-read this piece after reading the Sessions’ “Tukes of York” in which there is an interesting account of the early battles over these headstones. Many Quakers believed even stones such as these were too ostentatious and William Tuke was particularly enthusiatic in upholding a Yearly Meeting ruling that all stones should be removed. It was only later in 1850 that the ruling was relented and the modest stones reappeared including ironically one for William Tuke some 30 years after his death. The Sessions’ book (published first in 1971) records 32 headstones remaining. A nineteenth century plan notes the position of 150 named graves with other areas known to contain many unknown graves.